Location: Ytrac, in the Cantal departement of France (Auvergne Region). Ownership / Access: Saint-Vincent Family. 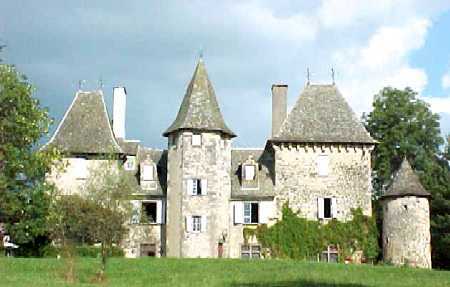 Notes: Château de Lamartinie is located in the commune of Ytrac in Cantal. The castle is the subject of a registration as a historic monument since 21 August 1989. The castle was very Lamartinie altered over the centuries and the whole succession of architectural styles from different periods ranging from the sixteenth to the nineteenth century century. Square house-keep working within the south wing, probably early sixteenth century, was attached a house flanked by a polygonal turret staircase in the late sixteenth century. Thus the oldest part of the castle consists of two bodies of rectangular house interconnected by an octagonal staircase tower. A north wing symmetrical south tower dating from the late eighteenth century or the nineteenth century and in 1895 a polygonal turret leaned on the east side and a tower northeast flanking, the counterpart of the southeast turret crowned with crows as the square tower, which we do not know the date of construction. A wing connects what defines a Pool2 court. In 1895 Bouygues, a family limousine bourgeois dress, do restore the castle by architect Lemaigre-Dubreuil2. Inside the castle, the decor is troubadour style. Castle Lamartinie served as a refuge to the inhabitants of Aurillac during the great plague, which decimated the region3. The manor is mentioned for the first time in 15922. the castle was for the families of successive owners Tournemire, Ollier, Cambefort Legendre, Aragonnes to Boschâtel, Bouygues, Saint Vincent.